57 civilian casualties and more than 100 injuries were caused today after 12 SAA surface-to-surface rockets hit a market in Duma, east of Damascus, today. Later in the day another two SyAF airstrikes and 3 additional rockets targeted locations inside Duma. 24 barrel bombs were dropped by SyAF helicopters on Darayya today and more than 20 SyAF airstrikes targeted Marj as-Sultan. Clashes break out between SAA and opposition forces in al-Karyah ash-Shamiyah, southwest of Damascus, 1 km north of Damascus International Airport. 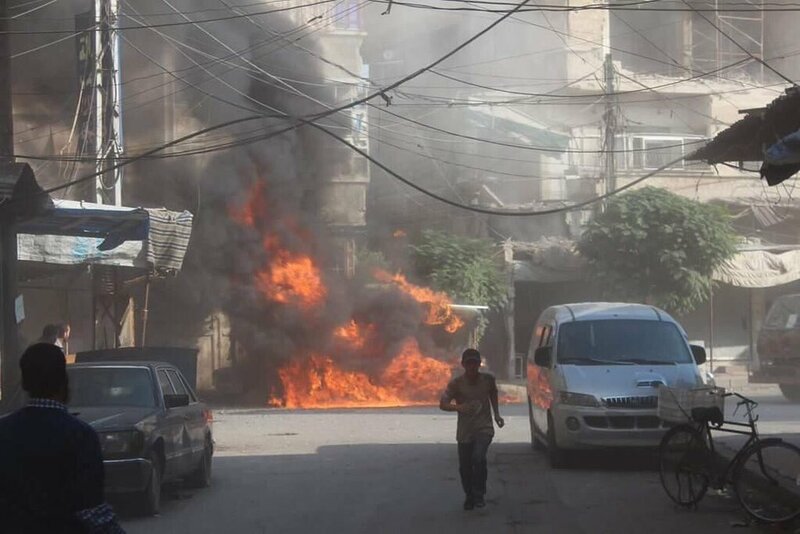 A fire rages in Duma after SyAF airtsrikes. Image courtesy of @riyadhalassad. 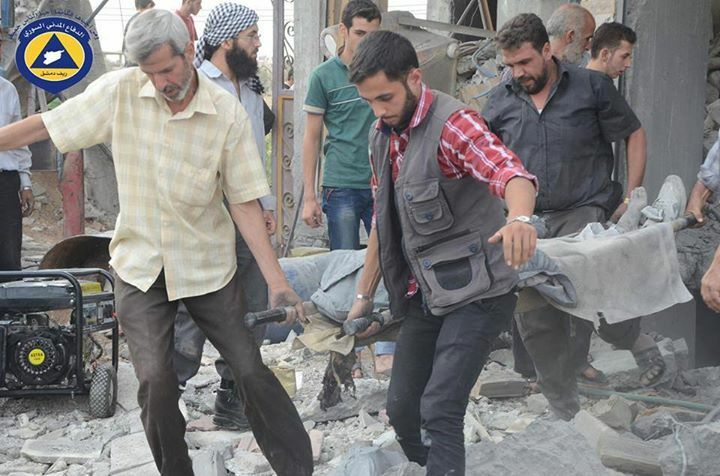 SyAF airstrikes on Duma cause the death of 8 civilians with reports of 4 others yet to be confirmed. SAA, NDF, Hezbollah, and Ba’ath Brigades clash with opposition forces and Jaish al-Muhajireen wal-Ansar, an islamist opposition faction that swore allegiance to JAN, in al-Zaharaa neighborhood. One opposition casualty reported. Clashes break out between opposition and IS forces near Marea, north of Aleppo. Reports of casualties on both sides. 3 SAA casualties including one captain during fighting against opposition forces in Jabburin. RuAF airstrikes on opposition forces in Sukayk. Image courtesy of Qasioun News. Opposition shelling of SAA-controlled Aadhamiyye neighborhood, southwest Aleppo, causes the death of 4 civilians and injures 24 others. SAA clash with IS in al-Safirah, southwest of Aleppo. 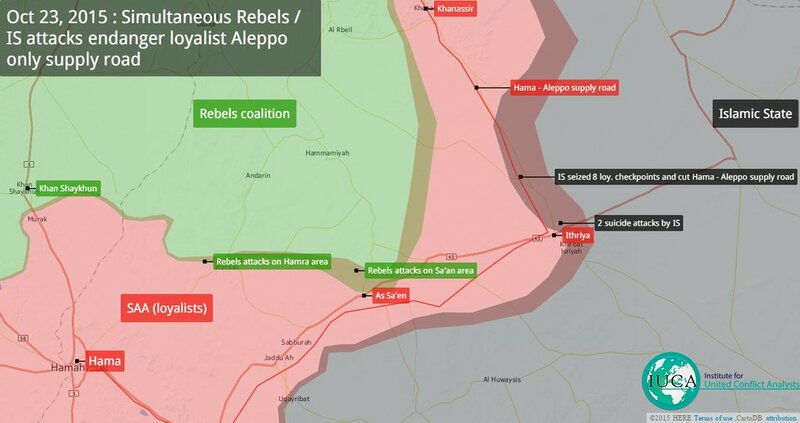 IS manage to block the road between al-Safirah and Aleppo. Fighting breaks out between SAA and IS forces in Tiyarah, 6 km east of Aleppo. IS and Kurdish forces clash in Sarrin, northeast Aleppo Governorate. Reports of casualties on both sides. IS fighter on the road between Khanaser and Ithriyah, southern Aleppo Governorate. Image courtesy of @wayf44rer14. The number of SAA casualties caused since the beginning of the IS attack on Khanaser – Ithriyah supply road has risen to 43. Reports of more IS casualties (in addition to the 28 reported yesterday). Opposition forces launch an attack against the SAA in Sheikh Saeed and al-Aziza neighborhoods, south Aleppo. Opposition forces manage to take control of the Cement Factory in the southern parts of Sheikh Saeed neighborhood as SAA forces destroy an opposition truck. Reports of casualties on both sides. SAA clash with opposition forces in Bani Zaid neighborhood, northwest Aleppo. Clashes break out between SAA and opposition forces in the Old City of Aleppo. Damage caused by opposition shell. 4 civilian casualties. Image courtesy of @edwardedark. RuAF airstrikes targeted al-Barfoum village, southwest of Aleppo, causing the death of 6 civilians including three infants. An opposition artillery shell that hit a Roundabout on Nile Street, west Aleppo, caused the death of 4 civilians. IS launch an attack against SAA and NDF forces in Tall Hasel and Tell Arn, southeast of Aleppo. An IS VBIED attack assists the IS forces in advancing in the area. 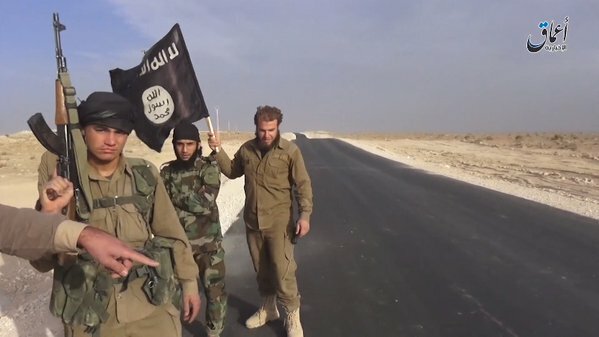 IS and opposition forces clash in Sandaf, north of Marea. An attempt on the life of the Ajnad al-Sham Islamic Union commander by unknown assailants in southern Aleppo with an IED detonated near his car was unsuccessful, managing only to injure him. Map of the IS attack on the SAA supply road to Aleppo. Full credit for the map: @IUCAnalysts. IS clash with SAA and al-Quds Brigades on the road between Khanaser and Ithriyah, south Aleppo Governorate, the only supply road under government-loyal control connecting the SAA inside Aleppo with other areas in Syria. IS manage to advance a few kilometers on the road as they carry out two VBIED attacks on SAA locations forcing them to stop all traffic on the road. RuAF airstrikes target IS forces in the area. 30 SAA casualties and injuries reported (unknown as of yet how many were killed and how many were injured) and 16 IS casualties. One of islamist opposition faction al-Fawj al-Awal’s commanders was shot to death by unknown assailants using a silenced weapon in Huraytan, northwest of Aleppo. Opposition and JAN forces clash with the SAA in al-Mallah Fields, just north of Aleppo. 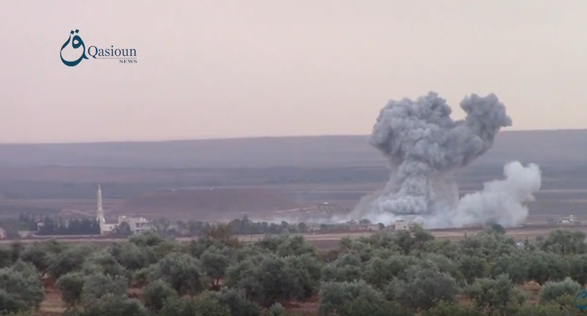 Opposition and IS forces clash in Tell Malid, 27km north of Aleppo. SAA clash with opposition forces in Shihan Roundabout, northwest Aleppo. Clashes break out between opposition and SAA forces in Halasah, a village southwest of Aleppo. Fighting breaks out between Kurdish and IS forces in Sarrin, 110km northeast of Aleppo. Rescue teams in SyAF airstrikes aftermath in Mesraba. Image courtesy of @EatingMyPeaz. SyAF airstrikes caused the death of 8 civilians in Mesraba, east of Damascus. Opposition shelling of an SAA controlled area on Nile Street in western Aleppo causes the death of 4 civilians. SAA and NDF clash with opposition forces in al-Muhallab Military Compound and al-Khaledia neighborhood, northwest Aleppo. Reports of casualties on both sides. 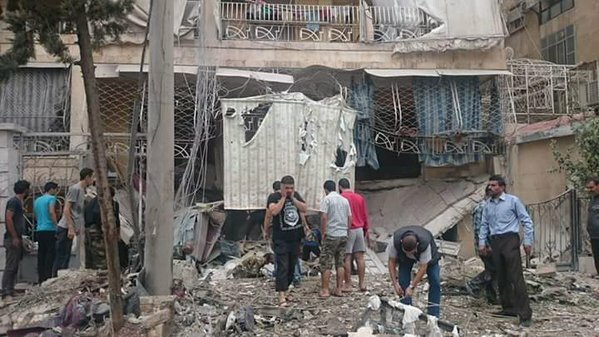 An IED explosion yesterday in the area of al-Ajami caused the death of 5 civilians. 4 civilians were killed by SyAF barrel bombs dropped on Busra, a village east of Daraa. Clashes broke out yesterday between JAN and another opposition faction near Tafas, north of Daraa. One JAN casualty reported. Jaysh al-Yarmouk opposition faction commander’s vehicle was targeted by an IED today on the road between Tall Shihab and Kharab al-Shahm. No injuries or casualties were reported.